RiverPlace Athletic Club rowing director Evelyn Hamann during a morning outing on the Willamette. AS A BOY growing up outside of Dallas, Texas, in the 1980s, picking a sport to play was a simple matter of multiple choice. Three choices, to be precise: tear up the gridiron like Dallas Cowboys running back Tony Dorsett; hurl fastballs like Texas Rangers pitcher Nolan Ryan; or jam arena-shaking dunks like University of Houston (aka “Phi Slamma Jamma”) baller Clyde Drexler. Any options outside this holy trinity of team sports were few and far between. I know, because I looked. It wasn’t that I had anything against these Lone Star standards. But as an average-sized kid who lacked both speed and even a faint desire to use my body as a battering ram, I wasn’t very good at them. Then again, nor was I some maladapted goober who holed up in his room playing Dungeons & Dragons. I wanted to sweat. I wanted to make the junior high “A” team at something. But as far as I knew, the sports well had run dry. Around this same time, I visited my dad, who had moved to Washington, D.C., after my parents’ divorce a few years earlier. And there, I caught sight of a lone rower cutting a V-shaped wake down the Potomac River just as the morning sun lit the white marble façades of the Lincoln Memorial and the Washington Monument. To a kid from dusty, crusty Texas, the scene was downright majestic. That could be me. Fluid. Graceful. No bone-crushing linebacker clamoring to clean my clock. Unfortunately, the Trinity River, which slinked languidly near my hometown, was muddy and ugly. It might have been good for catching crawdads or spotting water moccasins, but it was hardly a place where one would pursue a beautiful pastime like rowing. I never bothered to take up the sport. It would take 20 years and a move to Portland to rekindle my fascination: One morning, out for a drive in my Jeep, I caught sight of a solitary rower making his way up the Willamette River. And, just like I had done in D.C., I watched as the morning light bounced off the river’s ripples and the rower’s tiny boat. Now that was my idea of a workout: Fresh air. Peace and quiet. The West Hills rolling by like a pine-scented billboard. Sign me up, I thought. Of course, that’s easy for Hamann to say. 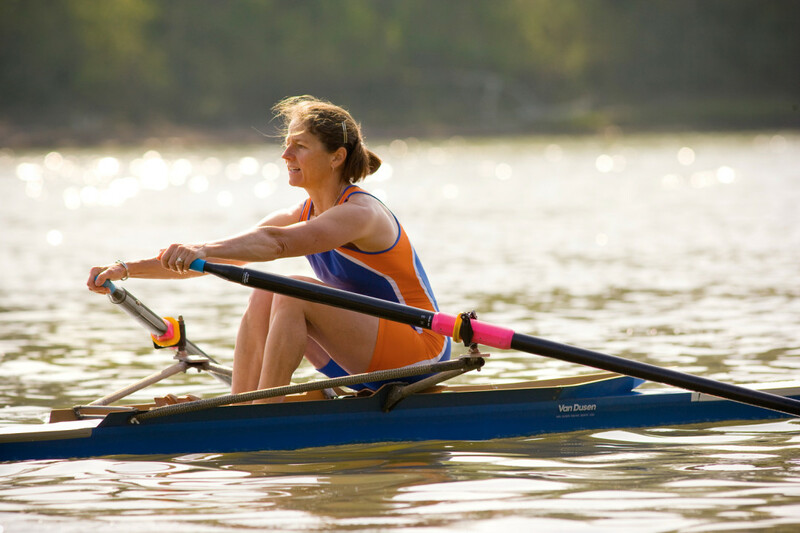 A 28-year veteran of the sport, she competed as a member of the U.S. National Rowing Team and also helped coach local Olympic rower Lisa Schlenker. Hamann is also one of the only trainers in town who teaches “sculling,” in which the rower uses two oars, rather than the single oar used by each member of a “sweep” rowing team. As I discover when I meet up with her for a lesson at RiverPlace Marina, she’s also a striking example of rowing’s physical benefits. At 51 years old, Hamann has the toned physique of someone half her age. Her handshake is sturdy, if not vicelike. But even if you’re not quite in Ironman shape, Hamann says the sport is very accessible (which might explain why Portland has more than a half-dozen rowing clubs). All it requires is getting in the boat, something that even someone who didn’t letter in a single sport—like me—can handle with ease. As a novice, I’m a bit relieved to learn that I won’t actually be venturing out into open water today. “We usually wait for the third lesson for that,” Hamann says. So instead of contending with the Willamette’s swift current and worrying about staring down one of the many jet-boaters rocketing themselves across the river this afternoon, I’ll be staying in the calm waters of the marina. Here, my only obstacles are a few empty dragon boats and high-dollar yachts bobbing quietly near the pier. But if I want to successfully navigate my little scull at all, I’ve first got to master the proper rowing form. Hamann helps me dial in the rhythm between my arms and legs on the club’s harborside rowing machines. “You don’t want the boat to know you’re changing directions,” she says, stressing the importance of sliding smoothly in my seat while I imagine the oars going back and forth in the water. Legs, back, arms. Arms, back, legs, I say to myself, memorizing the proper order of the strokes. Once Hamann has decided it’s time to try the real deal, I quickly learn that, even though I’m staying in the marina, I’ve still got plenty to think about—like getting the boat to the water without breaking it. Turns out these boats are called “shells” for good reason. Made up of a thin layer of carbon fiber, they’re extremely fragile. “We need to go straight from the rack to the water,” Hamann calls out as we lift opposite ends of the 22-foot-long shell I’ll be rowing today. We’d likely snap off the boat’s lone bottom fin or puncture its hull if we laid it down on the dock, which means that the shell—which runs around $4,000—would be ruined, and my lesson would get a lot more expensive. The boat’s frailty serves a purpose, though: The lighter the vessel, the faster it skims on the water. With the boat safely in the river, Hamann helps steady it as I carefully step in. Just before I plop my behind into the barely hip-wide seat, she offers this advice: “Don’t take your hands off the oars.” If I did, I’d probably tip over this decidedly narrow, and therefore extremely sensitive, craft—which is currently wobbling from side to side. I clutch the oars with a death grip. “No problem,” I say, determined to stay dry. For 20 minutes I practice my rowing while Hamann holds the nose of the shell. Legs, back, arms. Arms, back, legs. I’m beginning to feel like a hamster spinning a wheel when Hamann declares it’s time for my big moment: open water. Or at least a few paddles around the marina. I doubt I ever got more than 20 feet away from the dock. But as I drove my legs back in the seat and began slowly pulling the heavy oars through the water, I couldn’t help imagining myself cutting my own path down the Willamette someday just as the sun rose silently overhead, lending its fiery glow to the beginning of another day.